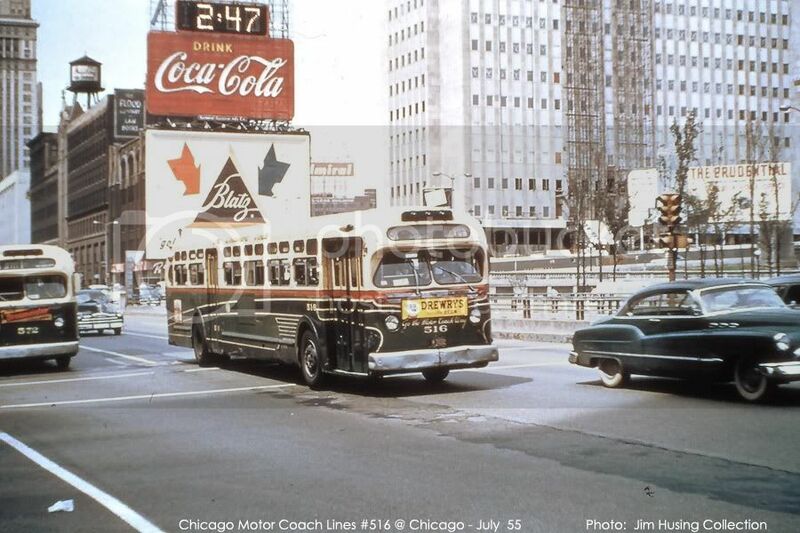 Very nice photo - looks like a TD 4506 - thanks for sharing - I am reciprocating with a photo of a 1948 Chicago TDH 5502 which was among 100 (501 to 600) 55 passenger jobs specially built for the 'Windy City'. When we refer to 'Omnibus', we speak of the Omnibus Corporation (headquartered in Chicago) which was the parent company to Chicago Motor Coach and Fifth Avenue Coach Company with its affiliates New York City Omnibus and both the Madison and Eighth Avenue Coach Companies in Manhattan. The ornate two tone green and cream livery that appeared on most 'Omnibus' equipment until 1950 (as is demonstrated in our images) was probably an Omnibus original idea. I have seen similar schemes in different colors on other early GM Old Looks but they were unquestionably copies. The Omnibus Corporation worked very closely with Yellow/GM in those years to the extent that they even assisted in design. The building at left almost looks like the since-demolished building along the block between Seventh Avenue and Broadway, and 47th and 48th Streets in Manhattan. The shapes of the numbers on the time display are identical to what was on a few Manhattan electronic signs, namely: the MONY building on Broadway between 55th and 56th; the 1960's-1970's Bulova watch animated sign display at Times Square just north of 46th Street, on the east side (next to the I. Miller building); and (until a few years ago) the Bulova time display at the SW corner of 34th Street and Seventh Avenue. In a photo taken in the late thirties we see fleet number 52 - a 1934 Yellow Coach Model 718 and one of 76 (1 to 76) delivered to the Madison Avenue Coach Company division of the New York City Omnibus Corporation. The model 718 was Yellow's first large capacity city transit featuring a transverse mounted rear engine combined with a patented angle drive and, of the 426 built between 1934 and 1937, 366 went to New York City Omnibus carrying three flags including its own, Madison Avenue Coach and Eighth Avenue Coach. The first 125 of these buses were originally built with air clutches but were later retrofitted with manual transmissions due to maintenance problems. The Madison Avenue Coach Company was formed in 1934 to replace the traction cars of the New York Railway Company (then owned by Fifth Avenue Coach) on Madison Avenue and Fourth Avenue below Grand Central Station at 42nd. Street. Interestingly, all 366 of NYCO's 718's came equipped with destination curtains listing the routes of the three divisions and we see # 52 away from its own territory and signed for the line 17 (now M14) 14th. Street Crosstown heading eastward to East End Avenue. The 718's were very versatile lasting well past World War II with some even being converted to Diesel Hydraulics. Photo courtesy of the Redden Archive. This was actually the 79th Street crosstown Route 17, later designated M17 beginning 1972-73 and now M79+SBS. 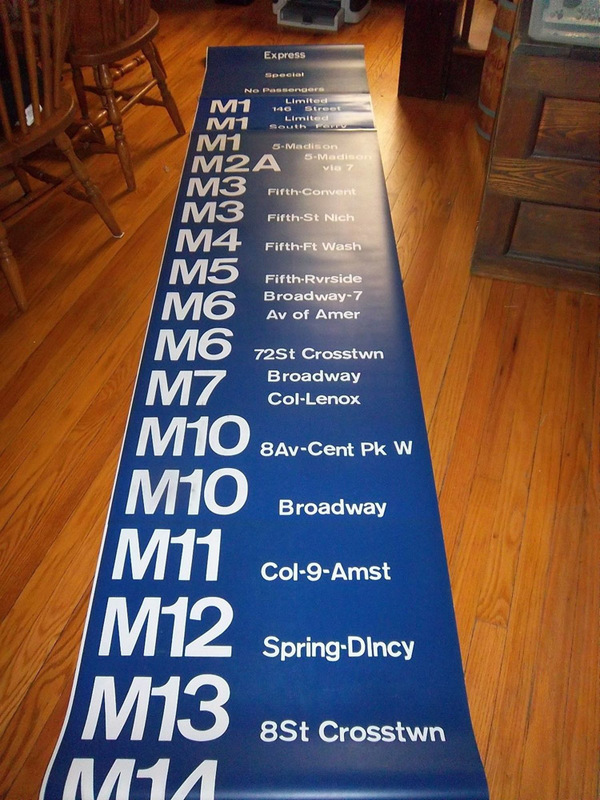 The original franchise for that route was to have been M-4. East End Avenue only exists under that name from the upper East 70's to a little past East 86th Street. Around 14th Street it's Avenue B.
I'll see you one and raise you one! (only kidding!). For whatever the reason, the company changed its name from Fifth Avenue Coach Company to Fifth Avenue Coach Lines sometime in the very late 50's and that flag showed up on the first FACCO New Looks numbered 1 to 10 in 1960 (those were experimental Air Conditioned jobs). Ergo; the transfer had to have been issued between very late 1959 and the MABSTOA takeover in 1962. Great transit map - thanks for sharing. Both Fifth Avenue Coach Company and New York City Omnibus Corporation were unloaded by The Omnibus Corporation in 1954, with NYCO then acquiring FACCo. On May 14, 1956, NYCO stockholders voted to change the corporate name to Fifth Avenue Coach Lines, Inc., with all bus rolling stock changed accordingly effective June 1. On Dec. 17, 1956, FACL completed its acquisition of Surface Transportation Corporation - and set up an operating subsidiary, Surface Transit, Inc., to oversee the six Manhattan and 47 Bronx routes that outfit operated. And that was the situation at the point MaBSTOA took over the whole schleboodle in '62. This is probably one of my last posts before I leave for the right coast. Contained are more interesting New York bus companies transfers found on eBay which, in of themselves, really draw a pretty precise map of the lines and what others they intersected in Manhattan. Note that the top transfer issued by the Comprehensive Omnibus Corporation for the Madison and Chambers Street route is dated February 20th. 1935 which was only a matter of days after they had taken over that franchise from Green Bus Lines. The 1959 transfer is instructive. Upon New York City Omnibus' corporate name change to Fifth Avenue Coach Lines in 1956, the routes that had been operated by Fifth Avenue Coach Company were grouped under the "Fifth Avenue Coach Division," while NYCO's array of routes came under the heading of the "Omnibus Division of Fifth Avenue Coach Lines." 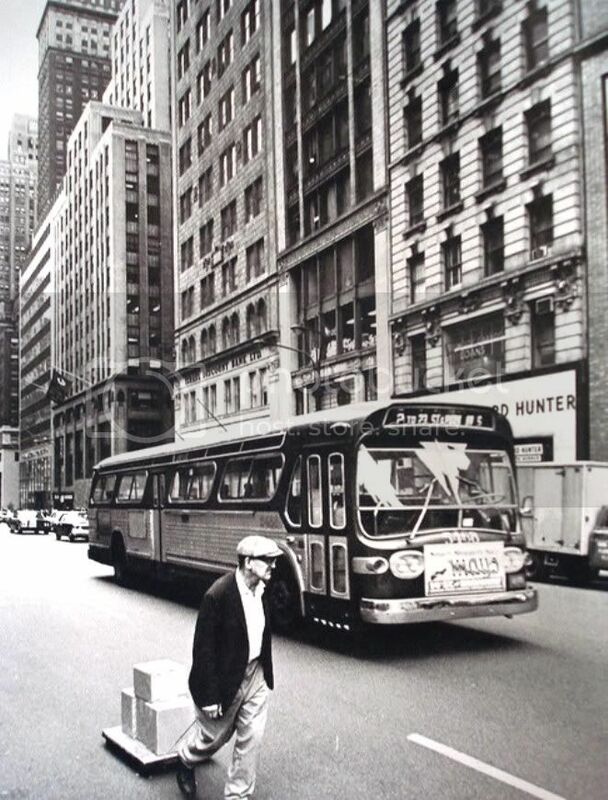 This would have been Fifth between 42nd and 43rd Streets (notice "The Record Hunter" store, a Fifth Avenue mainstay for decades), after the conversion of Fifth to one-way southbound in 1966. What's unclear is whether this 2 was the ex-FACCo Fifth and Seventh Avenues line whose northbound route was shifted to Madison Avenue, or the ex-NYCO Madison and Lenox Avenues line which had southbound buses moved to Fifth (and which, after 1969, was shifted below 116th at Lenox Avenue, to Third Avenue northbound and Lexington Avenue southbound, and renumbered 101A, and then again in 1974 as M102). MaBSTOA sought to alleviate any confusion, especially along Madison, by designating the ex-FACCo 2 as '2A' starting in or around mid-1966. That MABSTOA had batwinged '10 Broadway' signs was nothing short of ironic, given the old FACCo route. That designation lasted at least to 1973, on side signs right below '10 8th Ave-Central Pk W'. 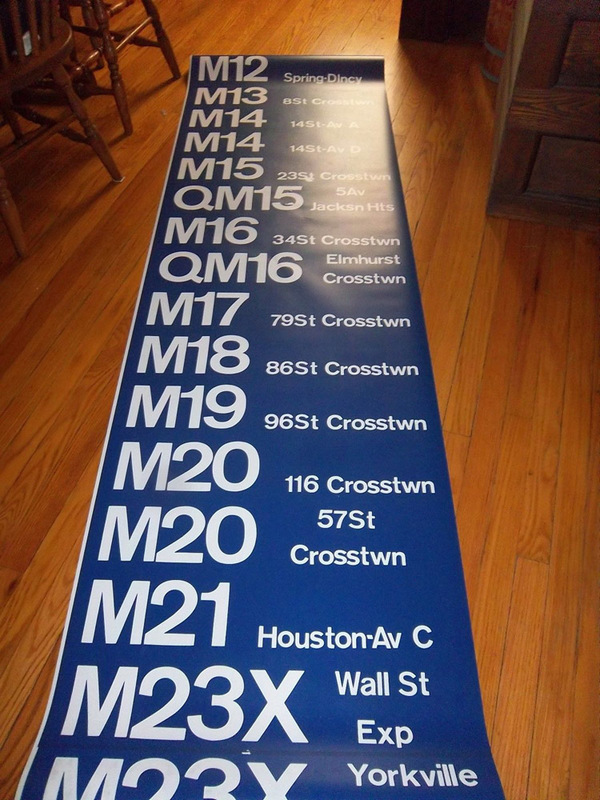 A 1974 side sign has to turn up (by which time M2A became M2, M101A became M102, M6 72nd Street became M30, QM15 became M32, QM16 became Q89, TB was broken up into M34, M35 and Bx21, etc. et al. - oh, and M107 disappeared) to get the answer to this one. But I also have to wonder if MaBSTOA's '10 Broadway' was reference, not to the vintage FACCo route, but to Eighth Avenue M10's that terminated northernmost at Columbus Circle or near Lincoln Center rather than 159th Street. The mood was jovial on Manhattan's Lexington Avenue at 59th. Street on March 26th. 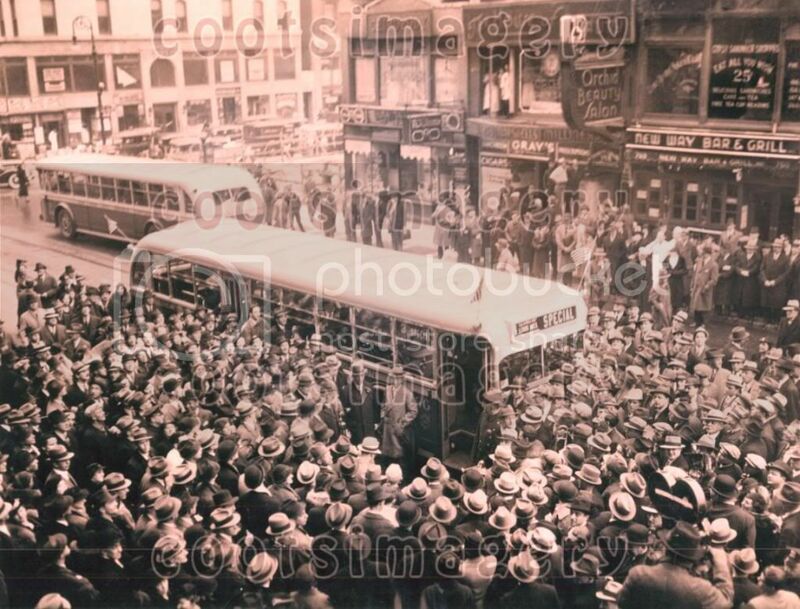 1936 as throngs welcomed the first buses to replace a nearly half century of trolley service up and down the famous thoroughfare. The buses, carrying celebratory flags for the occasion, were among fledgling New York City Omnibus Corporation's (NYCO) first to ply the streets of the Big Apple and were part of a fleet of 1935 41 passenger Yellow Coach Model 718's numbered between 146 and 366. The bus in the foreground is heading North to Lenox Avenue while its opposing sibling lumbers downtown. The larger of the two Manhattan trolley companies was the Metropolitan Street Railway System (approximately 1893-1911) which broke up in part after a bankruptcy filing in 1908. The core company became the New York Railways System, which was subsequently renamed New York Railways Corporation (NYRC) in 1925 and was controlled by Fifth Avenue Coach Company (FACCO). 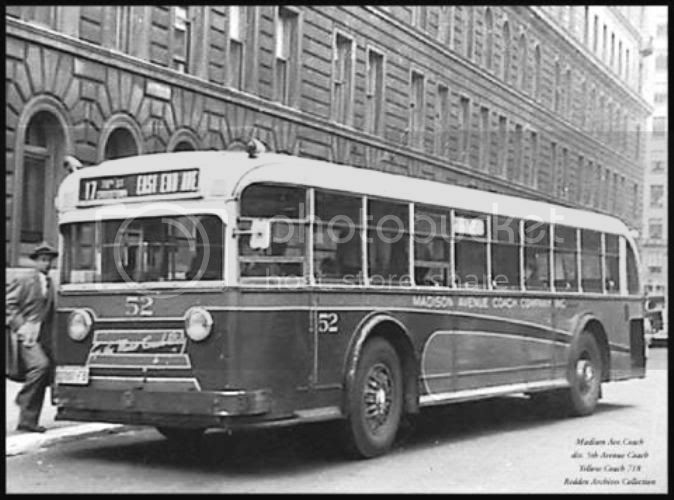 Two years earlier, FAACO incorporated the the name New York City Omnibus Corporation (NYCO) for the purpose obtaining city franchises for the replacement of its traction lines with buses which did not commence until 1936. Historic information culled from 'Local Bus Companies of Manhattan' by Joe Brennan. Photo and its accompanying caption courtesy of 'cootsimagery-deluxe' and are available at eBay as 'Buy It Now' under item #400509527339. After NYCO's name change in May 1956 to Fifth Avenue Coach Lines, NYCO's 3 - Lexington Avenue and 4 - Lexington-Lenox Avenues routes were placed under the heading of the Omnibus Division of Fifth Avenue Coach Lines. Both routes were discontinued July 17, 1960 - the day Lexington was made one-way southbound, and Third Avenue one-way northbound. (For the next nearly nine years, only Surface Transit's M-101, heretofore designated Third and Amsterdam Avenues, ran southbound through Lexington.) FACL then extended their ex-NYCO Madison Avenue routes 1 and 2 further north to 146th Street and Lenox Avenue - the 1 via 135th Street, the 2 via 116th Street. Then on Jan. 14, 1966 (almost four years after MaBSTOA's takeover of all ex-FACCo, NYCO and Surface Transit routes), Fifth and Madison were made one-way, with both lines' southern path shifted to Fifth Avenue. Because ex-NYCO 2 ran parallel with ex-FACCo 2 - Fifth and Seventh Avenues, between 9th and 110th Streets in both directions (and shared the same southern terminus of 8th Street and Fourth Avenue), there was initially some confusion between the two lines, especially along Madison, as they were both marked '2'. This was solved partially by designating ex-FACCo 2 as '2A' in mid-1966. But by 1969, the two 2's paths in that stretch had essentially become duplications of one another. So on March 2, 1969, ex-NYCO 2's entire southbound route below 116th Street was shifted further east to Third Avenue northbound and Lexington Avenue southbound, and renumbered 101A. Though now bearing Surface Transit numbering sequence, its pedigree was very much NYCO: not only a rerouting of said Fifth-Madison-Lenox #2, but a de facto revival of the old Lexington-Lenox #4. Then, on July 1, 1974, with several NYCTA and MaBSTOA routes in Manhattan, the Bronx and Queens renumbered to avoid duplicating other route numbers, M101A was changed to M102 (and Fifth/Madison/Seventh Avenues M2A, to M2). Now you'll get some idea of why we used to call Fifth Avenue the 'banana line' because the buses always ran in bunches! Seen along Fifth Avenue on the freezing cold afternoon of January 13th, 1966 are throngs of passengers awaiting their first rides after the end of a thirteen day strike over wages and benefits called by the Transport Workers Union (TWU) and the Amalgamated Transit Union (ATU) which was orchestrated by none other than the infamous Michael J. Quill (I can still hear his high pitched voice delivered with an Irish brogue so thick that you could cut with a knife!). 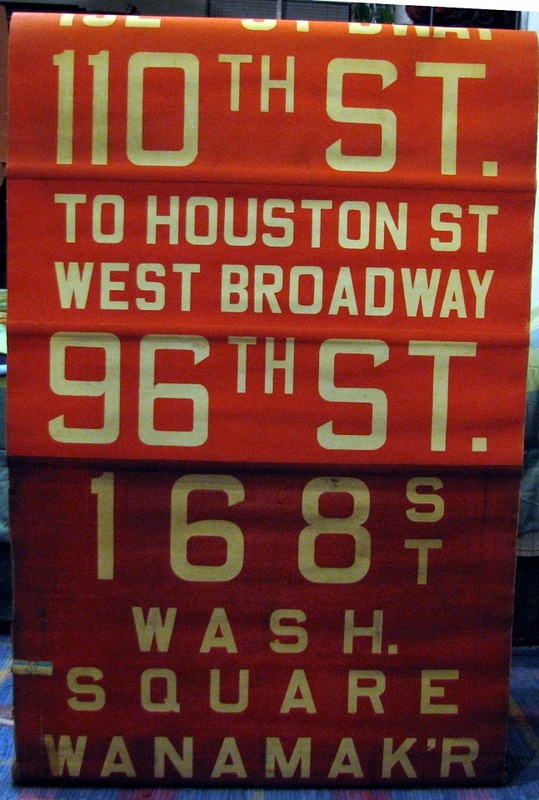 The buses, heading downtown to their terminus at Washington Square on the 5, 3 and 4 lines respectively, were all ex Fifth Avenue Coach GM TDH 5106's (easily spotted by their special destination sign cabinets built to accommodate fluorescent lighting) were operating for the then fledgling Manhattan and Bronx Surface Transit Operating Authority. The strike effectively ended all service on the subways and buses in the city, affecting millions of commuters. It was an ominous beginning for the mayoralty of John V. Lindsay, but is perhaps better remembered for the jailing of Quill and for his death only weeks afterwards. UPI photo courtesy of 'Afox11' and may be found as a 'Buy Now' listed on eBay as item # 400590412328. 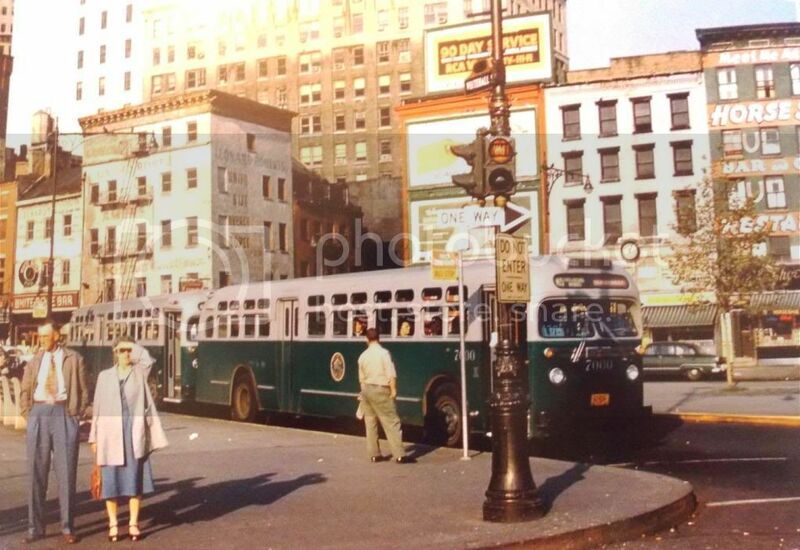 By then, the buses no longer terminated at Washington Square itself, the park having been closed to bus traffic effective Sept. 2, 1963, but rather one block north on 8th Street east of Fifth, which was the alternate terminus to the more easternmost terminus of 8th Street and Fourth Avenue. Evidently 'Wash. Square' on the roll signs was more a shorthand than a literal stop by that point. This was also one day before Fifth Avenue was converted to one-way southbound (as was the last remaining unconverted stretch of Broadway, between Madison Square and Union Square), and Madison Avenue to one-way northbound. The next day saw two ex-NYCO routes - #1 Madison Avenue and #2 Madison-Lenox Avenues - alongside the (ex-FACCo) 2, 3, 4, 5 and 15 on Fifth; while ex-FACCO 2 (which would become 2A a few months later), 3, 4 and 15 were rerouted northbound to Madison - and 5, to Sixth Avenue below 57th Street. Almost brand new in this 1958 shot taken at Whitehall Street in lower Manhattan we see fleet # 7000 - a 1957 45 passenger GM Coach Model TDH 5106 and one of 209 likenesses numbered 7000 to 7208 operating for the New York City Transit Authority. While # 7000 and a sibling standing behind it are dressed in a rather utilitarian scheme, they are certainly brighter and more cheerful then the drab and boring costumes of their ancestors. # 7000 also enjoyed fifteen minutes of fame when repainted in gold to participate in a Fifth Avenue promotional celebration campaign in 1957. The 7000 series was easily identifiable by their unusual Pantographic windshield wipers in which the blades maintained vertical orientation for a wider sweep and which were being field tested for use on the soon to be introduced GM New Look buses. Our focus awaits its next run on the M-13 line between Whitehall Street and 125th. Street via 1st. Avenue. Photo courtesy of 'bk.sales and is available at eBay as item # 271209906880. As First and Second Avenues had been one-way (northbound and southbound, respectively) since June 1951, that bus would have been M-15. But also notice, no advertising displays near the bumper or on the sides of the exterior. At what point did ad racks start showing up on these buses? Must've been the same point the first New Looks (a.k.a. 'Fishbowls') were placed into service by the TA in 1959. "It looks from that, that Routes 21 (Houston Street and Avenue C Crosstown) and 22 (Pitt and Ridge Streets) didn't come under NYCO purview until about 1946 or '47. I take it 22 was one of the four routes that were discontinued between the onset of the 1962 strike against Fifth Avenue Coach Lines, and the resumption of service under MaBSTOA? (The other three being FACCo's 1 - Fifth Avenue and 19 - Fifth Avenue/Riverside Drive; and Surface Transit's M-105 - Tenth Avenue.)" Route 22 was discontinued in 1942. Rush hour service was restored but by the late 1940s a once-a-day service was maintained until the city take ove in order to hold the franchise. 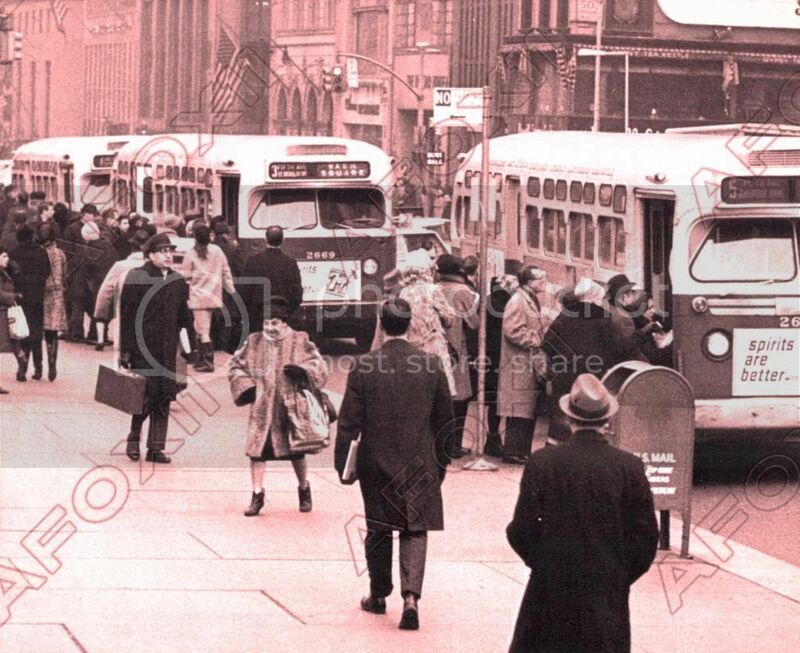 "After the 1962 strike against Fifth Avenue Coach Lines and Surface Transit, and the takeover of all their routes by MaBSTOA, Routes 1 and 19 disappeared from the itinerary, thus leaving only 2, 3 and 5 to terminate there. By mid-1963 a few of the newly-ordered MaBSTOA TDH-5303's numbered within the 3301-3555 range would stop along that loop. 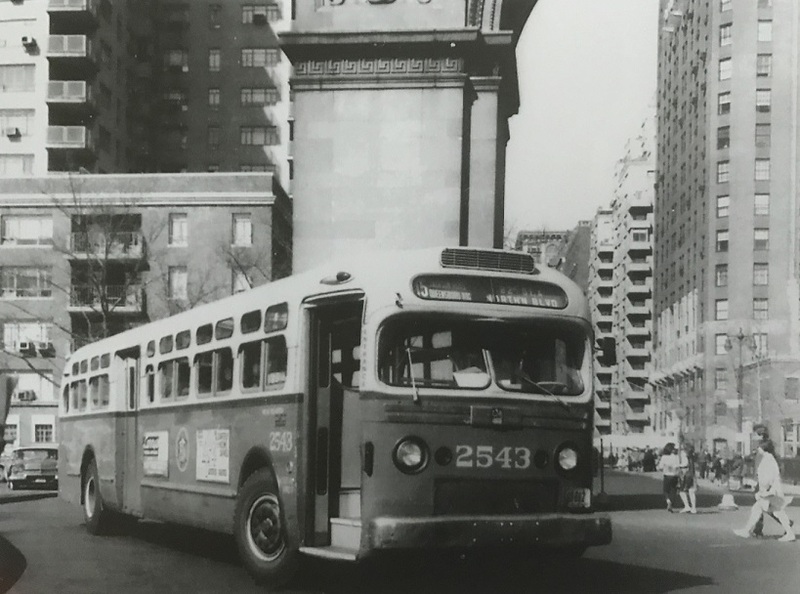 Those would be among the last buses to travel through the park, as effective Sept. 2, 1963 Washington Square was officially closed to all bus traffic, leading to massive reroutings and shiftings of the southern termini." After the take over by MaBSTOA, route 15 Jackson Heights, was extended to 8th Street and Fifth Avenue on November 10, 1963. Because the buses that were purchased for and used by Fifth Avenue Coach (routes 2, 3, 4, 5, 6, 15, 16, and 20) had destination signs for all of their routes no special readings were created for this extension. They simply used (on the red side) "8th Street" and/or "Wash. Square"
Below is a picture of 2543 making the turn to head north on Fifth Avenue to Queens. Note that the name "Fifth Avenue Coach" and the legend "Go The Motor Coach Way" have been painted out and ad racks added and a seal of the new agency, "MaBSTOA" placed between the racks. A follow-up query: If in fact the FACCo 10 was what was listed on MaBSTOA "winged fishbowls" (and would have been in place as late as 1973 if side signs with blue background and Standard Medium Condensed are of indication - 'M10 - Broadway' right below 'M10 - 8 Av-Cent Pk W'), and then if it survived past the 1974 route renumberings, what would this route have been rechristened as - M24? M33? 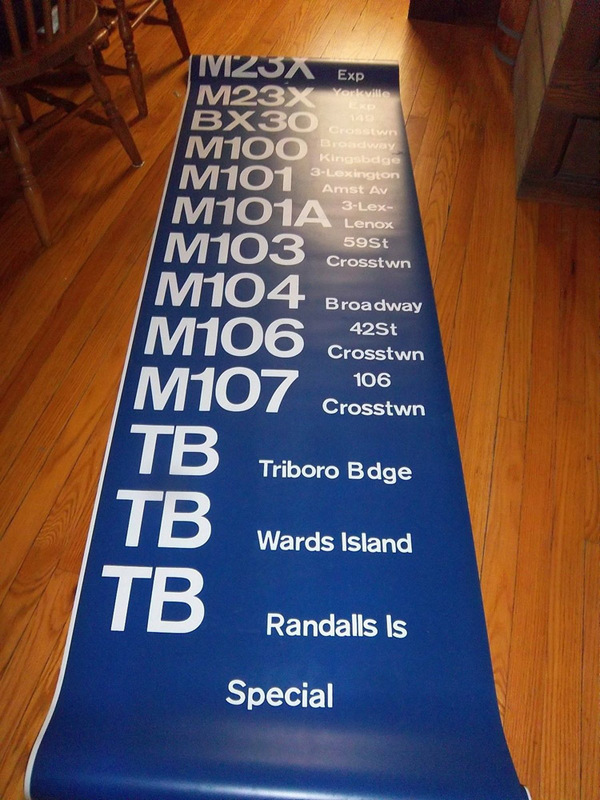 M105 (recycling the old route number of the old Surface Transit Tenth Avenue route)? Any idea? Ah, thanks for the clarification on that. So FACCo 1, NYCO 22 and Surface M-105 were all once-a-dayers by the point the 1962 strike commenced. (FACCo 19 was four times a day, according to a March 27, 1962 New York Times article.) 22 was listed among NYCO's routes on a c.1947 map that was misdated 1940 on the nycsubway.org website (the 1700 series TD-4506 pictured on the page where the map was, points to the later dating - and 21 and 22 wasn't in the itinerary at the point of the 1939-40 World's Fair, so evidently NYCO took them on after the WF was over by that yardstick). FACCo 1 had one extra thing the other two once-a-day routes didn't have: FACL claiming it held that franchise in perpetuity. While MaBSTOA didn't resume either 22 or M-105, FACL persuaded a judge to prohibit the new agency from also resuming FACCo 1. The 'To Houston St West Broadway' was an add-on, after the 5's extension thereto on Nov. 10, 1963. 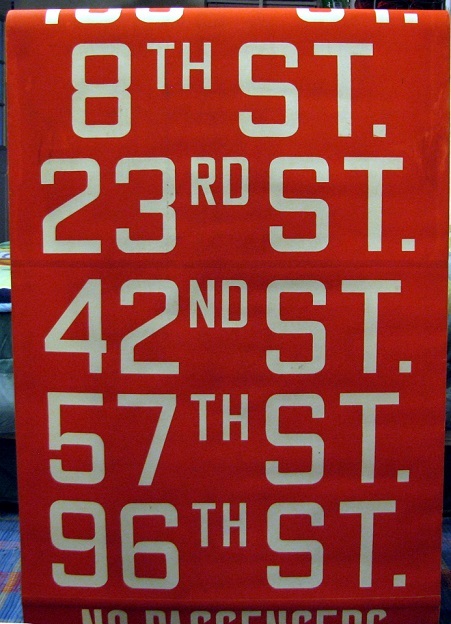 Here, from beginning to end, is (in pieces) the 1972-73 side signs for GMC Fishbowl T6H-5309A's, in use on MaBSTOA routes (via an eBay seller). Here you can see for yourself the 'QM' prefix on the two Queens routes MaBSTOA operated. 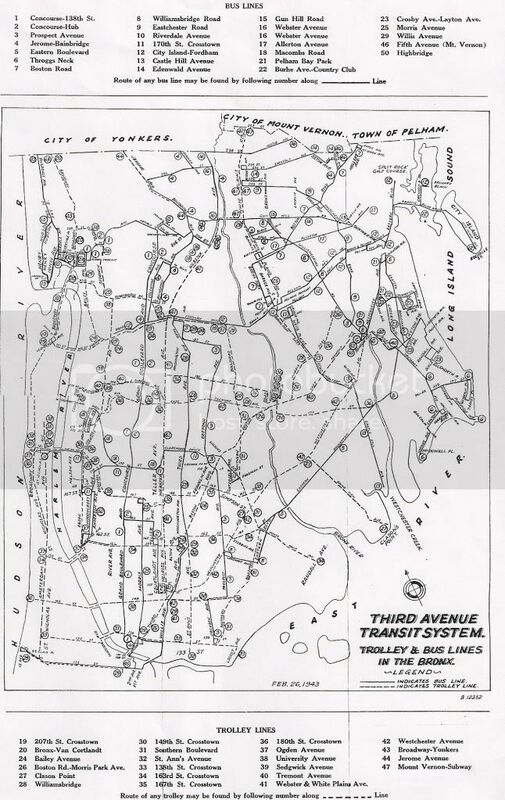 The only other private operator maps that I've seen were for FACCO, New York City Omnibus and Surface Transit.